As a member of the SFR Brigade, it's exciting to host this book today! I hope everyone grabs a copy. Thanks so much for hosting Tales from the SFR Brigade, Kayelle. 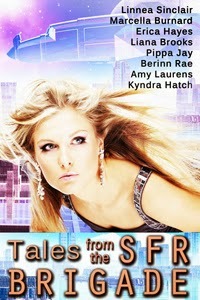 "Tales" was created to please fans of SFR and to introduce new readers to Science Fiction Romance who may not have sampled the genre before, the reason why this quality anthology is being offered for free. The eight contributing authors range from a best-selling RITA winner and RITA nominee to multi-award winners to a debut author. The stories showcase the variety and ingenuity of the SFR universe. Enjoy! Happy to have the opportunity, Laurie.